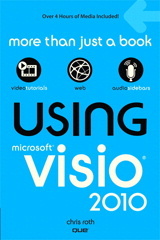 Of course Visio Guy offers great tips and tutorials for creating solutions with Microsoft Visio. 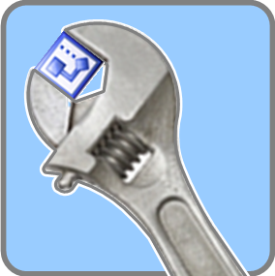 And there’s lots of great free Visio content here as well! But your time is valuable, and if you can’t find exactly what you need, why not get professional help from an expert? You can get the conversation going by using the contact form at the end of this page to send us a note. Or read about our services first, then send us your request! Microsoft Visio has a lot of customization features that enable you to significantly increase the value of visualization within your organization. With the right SmartShapes and targeted custom solutions, you can increase the value of both your Visio diagrams and your time spent diagramming. If you are primarily interested in knowledge-transfer, we can schedule a mini online-training session to help get you over the hump. 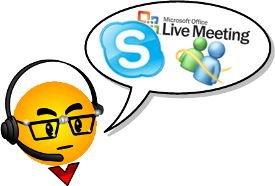 This can be done over the phone, or with Live Meeting so we can interact with Visio on our computer screens. Whether you need end-user tips for using Visio, would like to have a personal walk-through for key development concepts, or would like to discuss the architecture of a Visio-based solution, on-line consulting offers a quick and effective way to get you up to speed. Can’t find the exact shape you need? 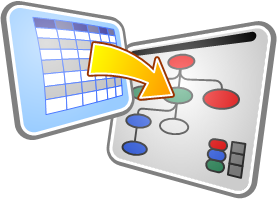 Impressed by Visio’s SmartShape technology and ShapeSheet interface? No time to learn how to do it? At your request, we can create a single, custom SmartShape or a complete set, packaged neatly into a stencil. We are experts at making the ShapeSheet do wonderful things, and we work fast and efficiently. Visio SmartShapes can contain a variety of features that make them better than symbols or clip art. 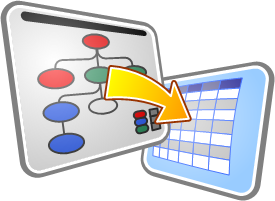 Visio shapes can contain Shape Data fields to hold data from your sources. Shapes can visually react to this data, display it in text, and even link it to real data sources. With Smart Tags and right-click Context Menus, sophisticated options and behaviors can be added to shapes to allow users to get just the right graphics. So whether you need custom org-chart, flowchart or business process mapping shapes, network symbols, scaled rack equipment, user-interface controls, or space-planning furniture and architectural elements, we can help you to build the right SmartShapes, to your specifications. Got a bunch of data that needs visualizing? Need to update it several times a day? Fingers hurt? We can save you all the dragging and dropping by automating Visio for you! 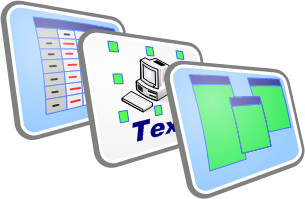 Our custom applications will help you create drawings from data at the click of a button. If your users are spending time creating drawings,why not extract the semantics of the diagram? With automation, we can automatically extract data and store it in a format that other applications can consume. Sometimes you just need a little automation to help you create your diagrams faster and more efficiently. If your drawing or diagram is your chief concern, perhaps some custom code could make the process easier. Title blocks, custom forms, etc. If an on-line consultation isn’t enough, and you feel you need a full training course, that is a possibility. My main area of expertise is custom Visio solutions development. I have both developed and taught classes on this subject many times. If we determine that your company could use a developer training course, I could put together an up-to-date course for between two and five days. For end-user training, there are probably enough companies out there that do this already, and you are more likely to find somebody in your neighborhood! Solutions we develop will be programmed using Visio’s spreadsheet-like ShapeSheet interface for SmartShapes, and C# or Visual Basic. Tell me a little about your diagramming needs.